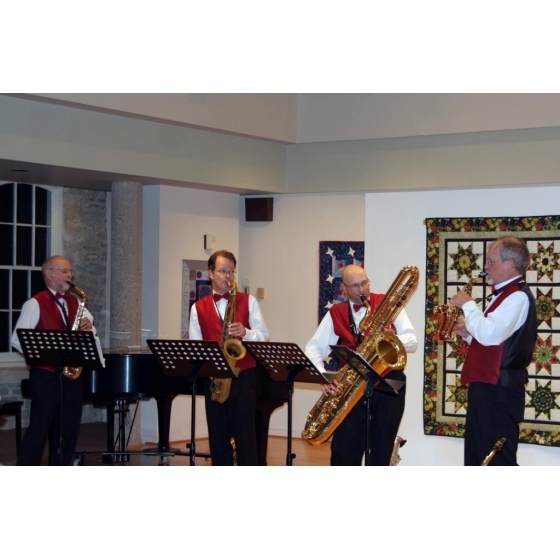 The Royal City Saxophone Quartet (RCSQ) was formed in 1991 in Guelph, Ontario. Since then, the group has carved its own niche in the genre of Ragtime. Their recordings Ragtime for Rent and Ticklin' Time have enjoyed worldwide appeal and have been featured on CBC Radio, on commercial classical stations, and on National Public Radio in the USA. Concert tours have taken the group to ragtime and jazz festivals throughout Canada and the United States including the du Maurier Downtown Jazz Festival in Toronto, the Evergreen Ragtime Bash in Colorado, the Grand International Ragtime-Jasstime Festival at Alexandria Bay, and the world's largest Scott Joplin Ragtime Festival in Sedalia, Missouri. In 1998, the RCSQ represented Ontario in a Canada Day performance before an audience of over 100,000 on Parliament Hill in Ottawa. Due to their range of sensitivity, expression, and dynamics, assembling four different members of the saxophone family together by four compatible and enthusiastic musicians achieves a new dimension in variety and musical creativity. Their musical promenades always leave audiences with lasting musical memories. Because of their dedication to chamber music, the RCSQ performs well at intimate settings from weddings, banquets and receptions to larger outdoor activities such as festivals, barbecues, graduations and grand openings. They have many Renaissance, Baroque and Classical transcriptions to enhance any intimate affair, and plenty of Ragtime, Jazz and Swing selections to "set the spark" for parties, celebrations and other festive occasions.